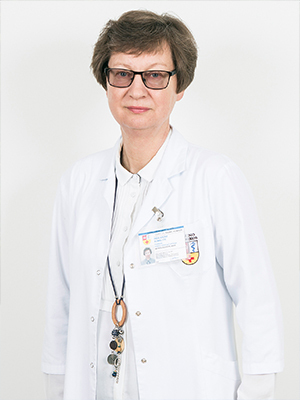 Nephrological Clinic of Lithuanian University of Health Sciences (LUHS) was established in 1992 and till 2012 it was guided by prof. V. Kuzminskis. Since 2012 prof. I. A. Bumblyte is a Head of Nephrological Clinic. During 25 years it became one of the most progressive nephrological centers in Baltic countries, because it provides full service for nephrological patients: clinical nephrology, hemodialysis, peritoneal dialysis and kidney transplantation. Subdepartments of clinical toxicology and therapeutic apheresis are included into the structure of Clinic, also. Nephrological Clinic has a good clinical basis. For this reason it carries significant academic and scientific work. Pedagogic staff of Clinic consists of 4 professors, 2 associate professors, 5 lectors and 5 assistants. Neprological Clinic is conducting module “Kidney and urinary tract pathology, clinical toxicology” (ECTS 6) for 5th year medical students. In Nephrological Clinic there are two residency programs. Nephrological residency lasts 4 years (it’s curriculum contains 2 years studies in internal medicine and 2 years studies in nephrology), residency of clinical toxicology – 3 years. 52 physicians graduated residency of nephrology and 7 physicians graduated residency of clinical toxicology since 1996. Changes of quality of hemodialysis in Lithuania in 1996–2000 (E. Ziginskiene, 2002). Clinical-morphological characteristics of glomerulopathies and prognosis of chronic renal failure progression (L. Razukeviciene, 2002). Changes of trace metal’s concentration in the blood of patients with chronic renal failure (I. Skarupskiene, 2003). Factors influencing hospitalisations of hemodialysis patients (R. Vaiciuniene, 2010). Factors influencing survival of hemodialysis patients in Lithuania (A. Stankuviene, 2010). Importance of preoperative investigation and postoperative monitoring of arteriovenous fistula function in patients on hemodialysis (S. Kybartiene, 2012). Life quality in patients with CKD in comparison with patients on renal replacement therapy (hemodialysis, transplantation) (N. Kusleikaite, 2012). Prevalence of chronic kidney disease and its risk factors among family practice patients (A. Zilinskiene; 2015). Evaluation of factors influencing kidney graft and recipient survival after kidney transplantation (E. Dalinkeviciene; 2017). Renal Anemia control of Lithuanian hemodialysis patients and the factors influencing it (K. Petruliene; 2017). Causes of severe acute kidney injury and the factors influencing outcomes (V. Balciuviene; 2018). Nephrological Clinic is conducting the LUHS programme „Optimization program of acute kidney injury and chronic kidney diseases: diagnosis, prevention opportunities and treatment “. In 2017 Nephrological Clinic guided LUHS-Kaunas University of Technology join project „Noninvasive cerebrovaslucar autoregulation monitoring in hemodialysis patients“. Since 2017 Nephrological Clinic is participating in Lithuanian Science Council project „Investigation of immunosuppressant concentrations detected by different methodologies with the functions of the transplanted organ“. Nephrological Clinic is very active participant of Sister Renal Centers (SRC) program of International Society of Nephrology. 15 years of collaboration with Ghent University (Belgium) supported the progress of nephrology in Kaunas. More than 20 conferences with famous international speakers, such as prof. N. Lameire, prof. R. Vanholder, prof. E. Ritz and prof. W. Van Biesen, were organized by our Clinic. 26 doctors visited Ghent University hospital during this program. In 2010 Nephrological Clinic became supervisor of SRC program for the Brest (Belarussia) Nephrological Centre and from 2016 for Lutsk (Ukraine). Over 40 lectures were presented in Belorussia and Ukraine, 22 doctors and 10 nurses from Brest and 4 doctors from Lutsk were trained in Kaunas. For the achievements in clinical, academical and scientific work, team of Nephrological Clinic is dominating in Lithuanian Association of Nephrology, Dialysis and Transplantation (LANDT). Since 2003 till 2015 prof. V. Kuzminskis was the president of LANDT, since 2015 prof. I. A. Bumblyte was elected president. LANDT became very powerful and active organization with numerous national and international conferences, educational activities for general population and patients, preparation of guidelines and participation in ERA-EDTA Renal Replacement Therapy registry.